CHICAGO (WLS) -- U.S. Senate candidate Andrea Zopp is demanding more debates and says one of her competitors, U.S. Rep. Tammy Duckworth, is dodging them. 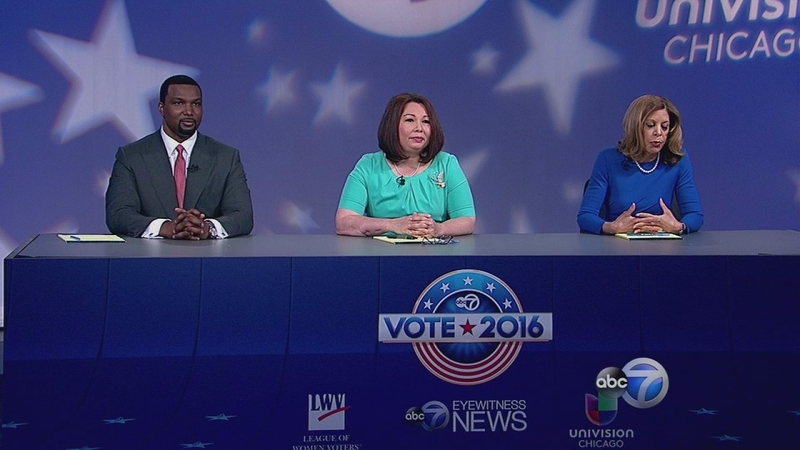 Zopp, Duckworth and State Senator Napoleon Harris took part in their last scheduled debate Friday night on ABC 7 Chicago. "Congresswoman Duckworth doesn't want to do any more debates because she's done very little for the people of Illinois," said Zopp in a press release challenging Duckworth to more debates. The Duckworth campaign responded to Zopp's calls Sunday evening saying in a statement, "We were pleased with the opportunity to participate in three substantive debates, and are looking forward to spending the final three weeks of the campaign traveling around the state." The statement continued, "If Ms. Zopp failed to make her points to her satisfaction over the course of three well-covered debates, she has no one to blame but herself."